I've just written another piece on infant safety in carseats and other devices that I hope you will read and forward to your friends with new babies -- it's got some very important information that just isn't getting out there, even though it is much more widely applicable than the bag sling recalls were. If you watched the news in early 2010, no doubt you saw hyped-up stories about baby slings being hazardous or even deadly (tune in at 11 for more details!!). Unfortunately, there are baby slings that aren't safe, but the mass media is rarely savvy about the differences between carriers, so everything gets lumped into one big "OMG it's going to kill your baby!!" category. Well, I've been making slings since 2000, and part of the babywearing community since 2001, so here are the things I have learned. What makes a safe sling? Any sling should hold your baby the way you would hold him in your arms (back carries excepted, and even those can be done in arms if you're flexible enough). 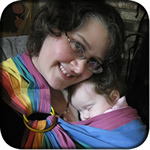 So for example, a ring sling is typically used with the baby in a vertical position against your chest, just like you'd hold him in your arms, or with the baby at a diagonal angle across your body, as you would hold him while breastfeeding or reclining. 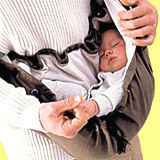 The same positions are preferred in a wrap, pouch sling, or mei tai. You should always be able to see your baby's head and face, without opening the fabric to do so, and he should always be able to breathe freely and easily, with his neck straight and his head in a neutral position (not curled forward onto his chest). Again, these positions, while they may take practice, are possible with every safe baby carrier. What you wouldn't do is hold him down horizontally against your hip, or squished up underneath your breasts, but that's what some carriers force you to do. They also may have an elasticized opening, a triangular cross-section, and a stiff base. Sometimes, to create a (false) sense of security, there's even a harness to keep your baby in one position. These carriers, colloquially known as "bag slings" (or more appropriately, "baby duffels"), all share several design flaws. First, they cut off visual access to the baby -- with the elastic sides, the "sling" is little better than a duffel bag, and it's impossible to see the baby's face unless the sides are held open. Because of the closed top, carbon dioxide can build up inside the carrier, reducing the baby's oxygen intake. Second, the flat base does not allow the fabric of the carrier to conform to the baby's body, and creates a real danger that the baby will roll to the side. This can be hazardous if the baby rolls towards the parent's body, even if the carrier has a "breathable" mesh panel, creating a suffocation risk. Third, the curved shape of the carrier essentially forces a newborn into the chin-to-chest position. In a newborn, the airway is very narrow -- about the diameter of a drinking straw -- and if the chin is pushed down onto the chest, this can compress the airway enough to reduce or even block airflow. This is called "positional asphyxia", and it occurs in any baby device that pushes the baby's head forward, including infant car seats, upright strollers that are not meant for infants, and swings. Fourth, the harness inside many of these carriers creates a false sense of security, locking the baby into an uncomfortable, unstable position, and leading the adult caregiver to believe that the baby is safe even though s/he can't be seen. Fifth, most of these carriers claim to be "one size fits all", but in reality, they are too large for an average-sized woman to wear, and even when adjusted tightly, the baby is at hip level, burried in fabric. Sixth, and less important for the baby, the limited adjustability and narrow strap often causes discomfort for the wearer. Elastic top; hard, curved bottom; narrow strap; poor visibility. Has now been recalled. Elastic top; hard, curved bottom; narrow strap; poor visibility. Drawstring top; c-shaped pouch; waist-level positioning shown in all promotional materials. Elastic top; c-shaped pouch; poor visibility. Slightly better in terms of carry position than the first two. Not quite a duffel; could be fine with bigger babies. Photos show infants chin-to-chest, w/elastic top and c-shaped pouch. Not quite a duffel, but forces infants into a chin-to-chest and limits visibility. You should always be able to see your baby's face, and check him frequently and easily without opening the fabric. The carrier should mimic the way you hold him in arms. If it doesn't, it should at least keep the baby in an upright position with his airway open and clear. It should be easy to get the baby into a safe position, without having to fuss with a buckle or other system. 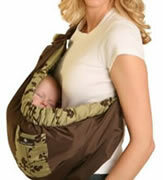 The carrier should fit your body easily, and keep the baby high and tight against your chest, not low on your hips. So, is your sling safe? If it fits the criteria above and you are following the included wearing directions, it should be. The most highly-designed carrier is not safe if the wearer isn't familiar with how to use it safely (and often, the most designed carriers, like baby duffels, are the least safe), and the simplest piece of cloth can be very safe if it's worn correctly. Unfortunately, the big baby companies who sell the baby duffels as above have not recognized the dangers they are creating, despite having been notified in 2006 that positional asphyxia and suffocation were a concern (see http://babyslingsafety.blogspot.com for M'liss Stelzer's work with baby duffels -- she is a registered nurse, and performed some informal testing with the major brands of baby duffels). Three deaths are now known to have occurred in this type of carrier, one family is suing, the CPSC is issuing a warning, and yet only the Infantino model has been recalled, which to my mind is deplorable, given that no carrier of this type can be worn safely by a beginner. Ultimately, your baby's safety is your responsibility, but if you're starting with an unsafe carrier, obviously that will impact your success. If you have any concerns about your carrier, please contact the manufacturer or seek out a local babywearing group for advice. The CPSC warning statement discusses proper positioning in a sling, and although it fails to distinguish between types of sling-style carriers, it's important to note that it is virtually impossible to wear a newborn in a baby duffel in a safe manner as they describe it. I have made up a business-card sized statement that you can print out and carry, for those helpful but not-very-knowledgable strangers who will have seen the sensational news stories but who are unaware that there are different kinds of carriers. Print them out here (PDF, opens in new window). This page is now available as a printable handout (PDF, 127Kb). Print pages 1-2 for basic information; page 3 contains the table showing different bag-style carriers, which can be printed if desired, or left off if you wish to be brand-nonspecific.